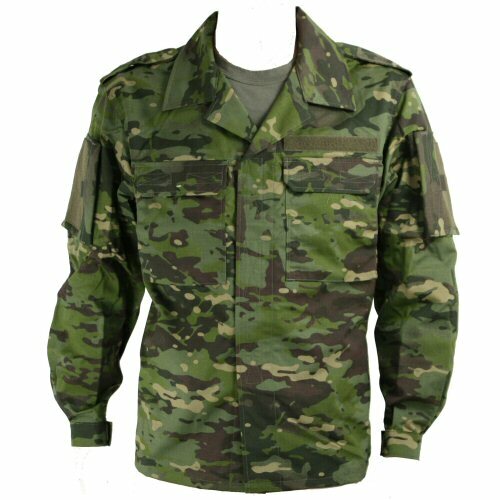 The KSK commando shirt or field shirt is an operator designed shirt which incorporates enhanced features whilst retaining the lightweight function and form of the standard issue duty shirt. The shirt is medium weight for greatest versatility for active wear in all climates, for example, as part of a layer system in colder climates, or on its own as a lightweight jacket in hotter climates. The shirt retains the collar, velcro down shoulder tabs and velcro cuffs of the standard issue shirt but incorporates additional ventilation holes under the armpits and an expandable arm pockets on both arms. 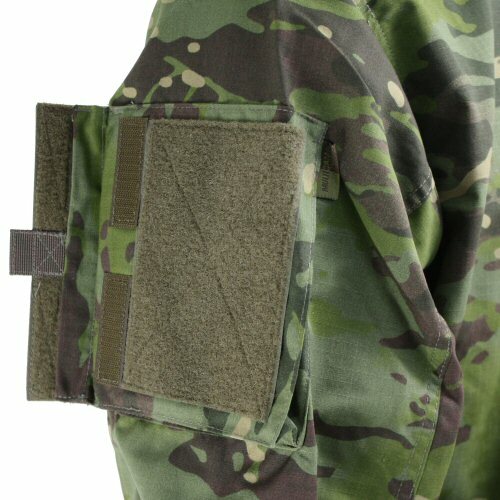 These pockets are the same size as the chest pockets and are set at an able to enable easy opening when armour is worn over the chest and torso. The pockets are fitted with a return flap to prevent contents from being lost when the flap is closed, and a 25mm twill tab is set to alow for easier operation when being opened with gloved hands. 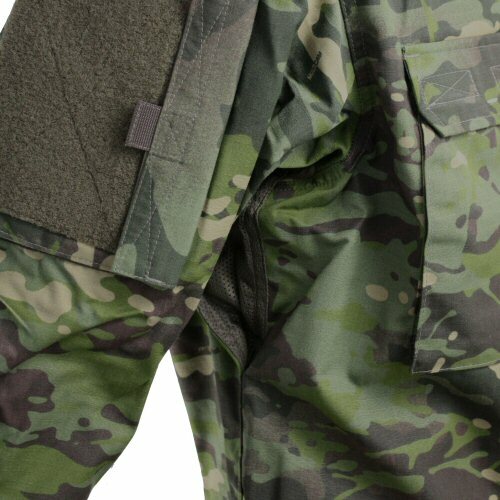 The front of the pocket is fitted with velcro for the attachment of other insignia, such as blood patches, unit patches and other insignia. The front of the shirt is fitted with the two chest pockets of the standard issue shirt, but with all buttons removed. The pockets open with two patches of velcro each, and are expandable in the same way as the standard issue shirt. A 25mm wide patch of looped velcro is provided over the left chest pocket for name tapes. The front of the shirt is fited with three 30mm wide, long strips of velcro as central opening. These are separated so as to allow the shirt to ventilate down the chest. All press buttons and zippers have been removed in order to remove pressure points against the body when body armour, particularly with ceramic plates, is worn. 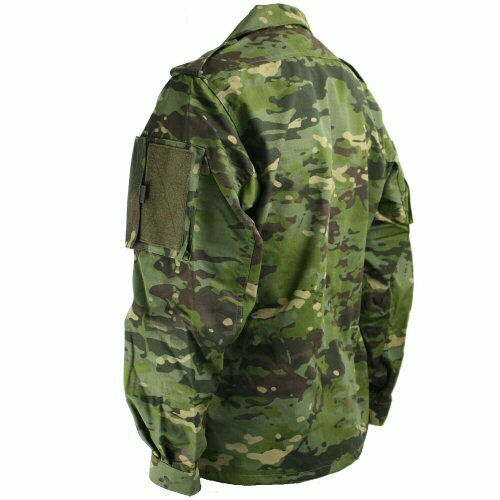 The shirt is made from genuine Crye Precision Tropical Multicam milspec NYCO fabric, printed in the USA. 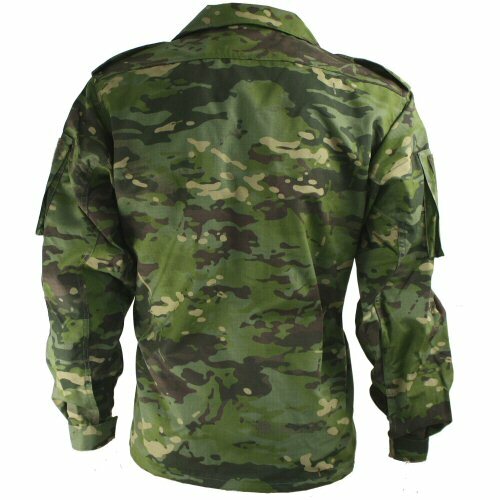 The shirt is ideal as a lightweight jacket when the weather or activity level exceeds the threshold for wearing the KSK jacket, or when body armour is to be worn over the base layer. The side of the shirt, showing generous upper arms and the upper arm pocket. Underarm ventilation through the mesh panel.